Buffalo Mozzarella Sticks - two favorites combined into one! SO good! Only 2 ingredients and ready in 15 minutes. Great for parties and tailgating. 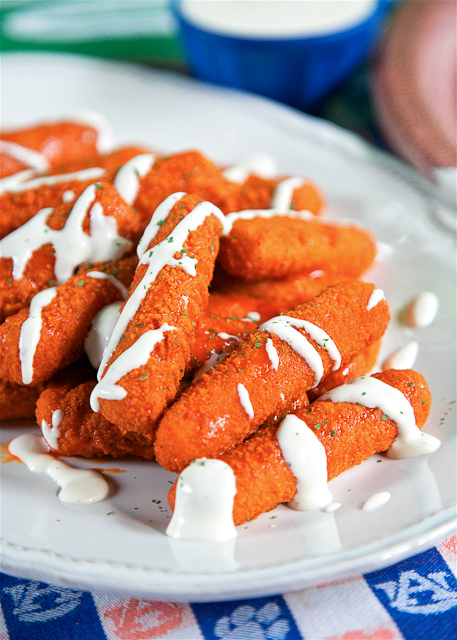 This recipe combines two of our favorite foods - buffalo wings and fried cheese sticks! I've had this idea for Buffalo Mozzarella Sticks for a while and I finally got around to making them. I can't believe I waited so long! These are SO good!! They are even better dipped in some ranch or bleu cheese dressing. YUM! I love that there is no prep work and they are ready to eat in under 15 minutes. Isn't that awesome? I mean, who doesn't love 15 minute recipes?!?! We really loved these Buffalo Mozzarella sticks and you can bet that they will be on our tailgating menu this weekend! Cook cheese sticks according to package directions. While cheese sticks are baking, heat up buffalo on stovetop or in microwave. 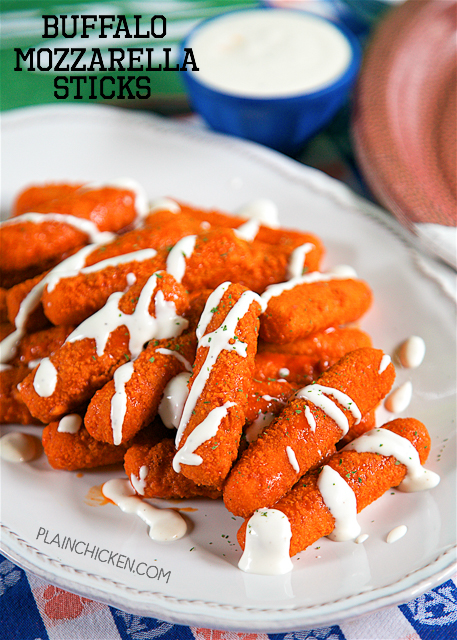 Dip cooked cheese sticks into warm buffalo sauce. Shake off excess.